During a routine grazing assessment of Malling Down today, I decided to have a quick look for the mythical Red Hemp-nettle that has not been seen there for well over a decade (word of mouth from a previous site manager) and it would seem not recorded there since 1987 according to the SxBRC and the reserve spreadsheet. I’ve looked for it four or five times to no avail. Then today I walked up to an area I thought looked suitable and recorded 17 plants! It really goes to show that persistence is key in natural history. It would have been really easy to give up but I had a hunch this species was still there, ticking along for all these years. Perhaps it’s having a good year or in previous years I was maybe too early. I’ve only ever seen this plant at Rye Harbour, its stronghold in the county along with Pevensey Bay and Pagham. What’s all the fuss about though? Well this plant is classed as Critically Endangered on the Red List, basically the highest level of assessment you can get before going extinct. 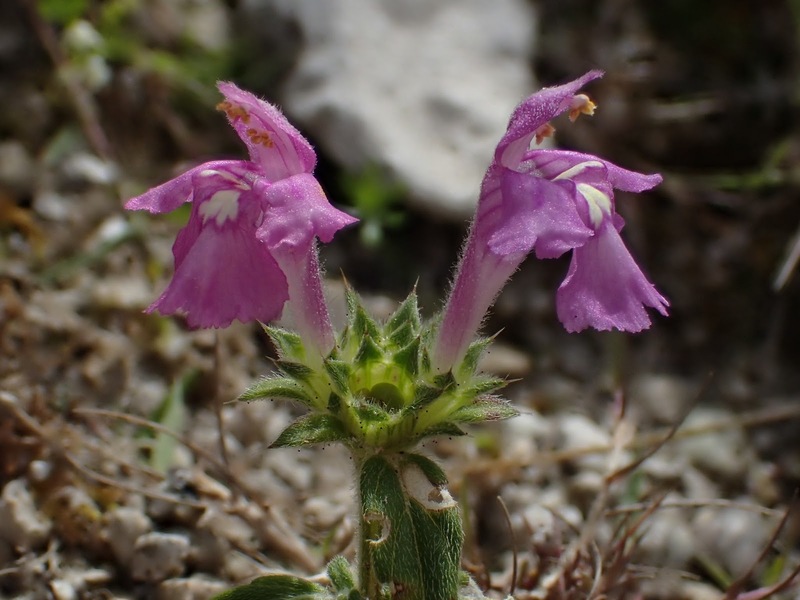 So it’s great that this little plant with big flowers has been re-found at Malling Down after all these years, as it’s now only known from a few dozen sites according to Plantlife. You can read up on it here. At Malling, the ‘natural’ (it’s an old quarry) creation of chalk scree formed by erosion in the quarry is all that is needed to keep this habitat open, although long-term it will probably need some scrub clearance. Being an annual, it must have been here all along as I don’t think it’s been lurking in the seed bank. It’s a poor competitor, and likes bare, loose chalky or sandy soil. At Rye Harbour it grows on the vegetated shingle, at Malling, it’s at the bottom of a huge quarry, right where I always thought it would be! Why I have not seen it before, I don’t know but I suspect I have been looking too early. Here is a shot of the habitat. We GPS’d 17 plants in all, 13 in one cluster, then three and then a singleton, all quite close together. As the 1987 area was given only as a six figure grid reference, we now have more detailed records to eight figures of where the plants are growing. Suitable looking habitat further up the slope held no more plants. There is another area in the quarry that would take a bit of getting to that might be worth a look though. Brilliant news! Source: Graeme Lyons ‘Critically Endangered plant seen at Malling Down after not being recorded for 30 years!’ The Lyons Den, 7 August 2017 https://analternativenaturalhistoryofsussex.blogspot.co.uk/2017/08/critically-endangered-plant-seen-at.html. With permission.